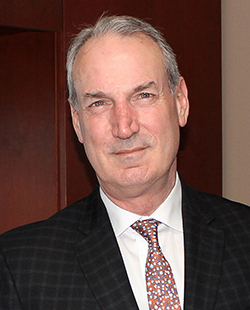 In honor of his outstanding work and significant contributions, Douglas E. Wood, MD FACS, FRCSEd (ad hom), The Henry N. Harkins Professor and Chair, was presented a 2019 Society of Thoracic Surgeons (STS) Distinguished Service Award at the Annual Membership Business Meeting. An STS member since 1995, Dr. Wood has been a long-time volunteer. He has served on the Society’s Board of Directors as President and as Secretary, as well as held positions on other governance bodies, including the Executive Committee, Finance Committee, Standards and Ethics Committee, Workforce on Health Policy, Reform and Advocacy, and Workforce on Critical Care. In addition, Dr. Wood currently is President of The Thoracic Surgery Foundation, the Society’s charitable arm. A world-renowned surgeon in thoracic oncology, Dr. Wood specializes in lung and esophageal cancer. He is a national and international leader in the management of complex airway diseases and in the surgical management of end-stage lung disease. He has used that expertise to help secure Medicare coverage of low-dose computed tomography lung cancer screening for at risk-populations in his roles as Chair of the National Comprehensive Cancer Network (NCCN) Lung Cancer Screening Panel and Vice-Chair of the NCCN Non-Small Cell Lung Cancer Panel. Dr. Wood also has represented the Society on the Lung Cancer Guidelines panel of the American College of Chest Physicians. Throughout this career, Dr. Wood has been a prolific surgeon-scientist, with more than 20 grants and 200 publications. He also has been devoted to graduate medical education. Passionate about working with residents and junior faculty in both US and international programs, he has been a visiting professor at approximately 50 institutions worldwide. Dr. Wood received his undergraduate and medical degrees from Harvard University and completed his general surgery and cardiothoracic surgery residencies at Massachusetts General Hospital in Boston. After spending a formative year as a surgical registrar at the Royal North Shore Hospital in Sydney, Australia, he was recruited to Seattle to lead a new section of general thoracic surgery at the University of Washington, where he is currently the Henry N. Harkins Professor and Chair of the Department of Surgery.